How to look after a 5-year-old fruit tree? What is the primary purpose of a fruit tree? Well, I suppose the hint is in the name — fruit production. I was asked this question on Spirit Radio the other day and immediately I thought of feeding, pruning forgetting about the primary purpose of the tree — edible fruit. Pruning – extremely important — remove all dead, diseased wood. Shape tree, fruit is produced on new growth also you want to be able to harvest the fruit, so don’t it allow it to get to high and out of reach. Check tree ties — many fruit trees especially young will need a tie with a stake for a couple of years as fruit — especially apples can be very heavy and the tree will bend with the weight. 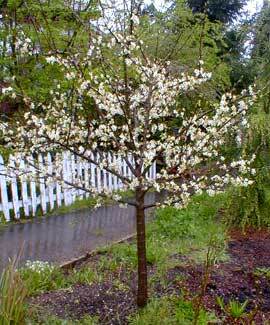 Therefore on a very young tree, it is recommended to remove most if not all of the fruit for the first year or 2. As Mentioned the primary purpose of a fruit tree is to produce fruit. Like tomatoes — which you are also growing for their fruit, you will need a feed high in potash. necessary for flower formation — flowers lead to fruit. Potash is an interesting mineral. Potassium occurs abundantly in nature. It is the 7th most common element in the earth’s crust. Certain clay minerals associated with heavy soils are rich sources of K, containing as much as 17% potash. Large potash bearing rock deposits occur in many regions of the world deriving from the minerals in ancient seas which dried up millions of years ago. Most potash for fertiliser is derived from one of these potash rocks. Excess potash can cause problems for plants that prefer acidic or balanced pH soils. The woods from your fire added to your compost will have traces of the worthy ingredient. Most of the wood you burn in your firewood ash is mature or old therefore you will not have as high a concentrate as with young wood — but worth adding to your compost bin — make sure you mix it in as it can become a bit clogie — like the way grass can lump up in your compost. Potash which literally comes from the rendering of charcoal which has been burnt down to ash at very high temperatures in a pot — hence the name potash. Your kitchen compost — banana skins are a very good source. Adding pure mineral to your soil on occasion is ok but feeding your soil with well-mixed compost, well-rotted manure is preferable. Seaweed is another excellent source. In spring add some extra potash (Potassium) to your soil – also good for all flowering shrubs – eg. wisteria to promote blossom.